These are workshops of 2018. 2019 workshops will be announced soon. What are the opportunities emerging globally and in India? What are the challenges? What are the new business models emerging in the IOT landscape? What are the new technologies that are enabling innovative IOT solutions? What are the typical business challenges and how have those been overcome? What are the new business models emerging in the IIOT landscape? What are the new technologies that are enabling innovative IIOT solutions? How’s IIOT benefiting industrial/manufacturing sector across the globe and in India? What are the opportunities and business benefits presented by IIOT? What are the new business models emerging for SIs in the IIOT landscape? How’s the game changing? Who are the key IIOT players seeking system integrators ? How’s the IIOT tech stack evolving to make it easier for SIs to deploy solutions? How’s IOT benefiting retail sector across the globe and in India? What are the opportunities and business benefits presented by IOT for retail? What are the new technologies that are enabling innovative IOT solutions for retail? What are the key tech trends defining IOT devices and their Acquisition capabilities? What are the latest technologies, platforms and hardware available to develop solutions faster, better and cheaper? What are the engineering challenges in developing solutions that ACQUIRE, and how have they been overcome successfully? Topics Sensors, Development Boards, Communication Chips, Processors, EDA, Interfaces, Standards, Security, etc. What are the key tech trends defining IOT devices and their ANALYTICAL capabilities? What are the latest technologies and platforms available to develop solutions faster, better and cheaper? What are the engineering challenges in developing solutions that ANALYSE, and how have they been overcome successfully? What are the engineering challenges in developing solutions that INTEGRATE, and how have they been overcome successfully? What’s blockchain and why is it a great enabler? What types of applications can benefit from Blockchain? Which one’s can’t? What are the tools, platforms and technologies available to implement Blockchain? How to start the ball rolling? What are the latest threats and challenges to the security of IOT solutions across the globe? How are these being tackled successfully? What are the latest tools and best practices to make IOT solutions secure? What are the upcoming threats, and how badly can they affect? What’re the type of projects gaining popularity within the DIY community? What’re the coolest components, tools & equipment in the market? What’re the latest practices being adopted by the Gurus? Why and How the DIY phenomenon is changing the industry and entrepreneurship? 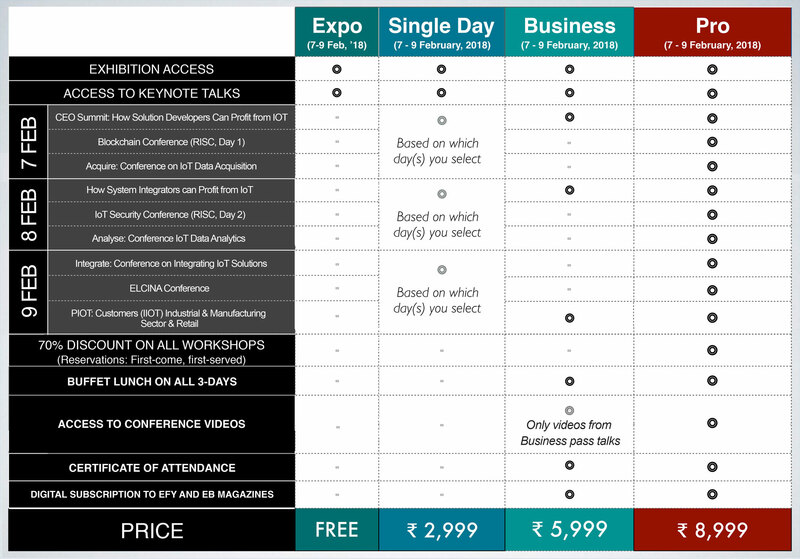 Besides IOT-related conferences, more technical and business conferences are beind held at the same time at the same venue, thanks to co-located events at India Electronics Week.